Working medium : Pulp,slurry,dust, etc. 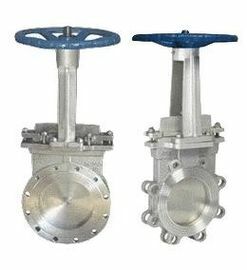 Knife gate valve is a kind of gate valve which is shut off valve directly, the gate is slap type and gate head is design with bevel cutting edge, which has a cutting action to medium, Knife gate valves are suitable for those mediums contained fibers and solid particles, and sewage treatment systems. Operated by manual, pneumatic or electric actuators, knife gate valves are widely used in the process of automatic control systems in paper making, mining, chemical and sewage treatment industries, the internal structure of knife gate valve is very simple, so in the same size, their price is cheaper than other type gate valve . 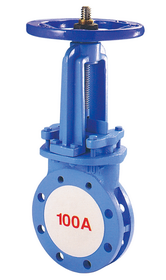 1. lntegral body design, small flow resistance, smooth operation. 2. Stem drive is designed with2 plane bearings, the driving friction is greatly reduced so making operation of valve beoomes smooth andlight. 3. Seat with moveable sealing design and 0-ring oan provide a preloading foroe to push the seat sealing ring touohing tightly with gate whioh can provide a self oompensation to the sealing surface when it had been worn afterlong time in servioe, so its servicelife can be increased. 4. 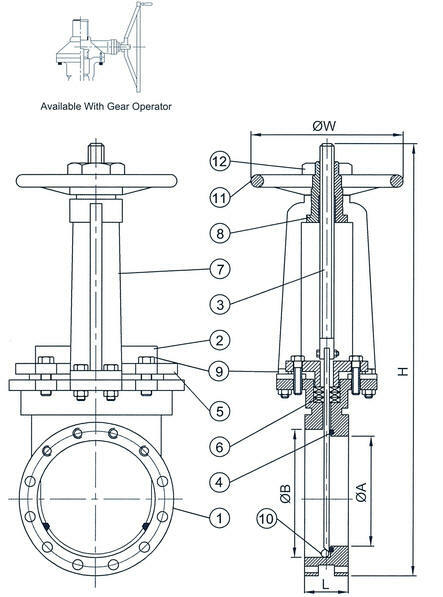 Fixed guide olaw, without groove design, so medium is not easyto be accumulated and blooked. 5. Material of seat is seleoted aooording to the medium and service condition, choosing metal seal or soft seal. Metal seal with gate surface is coated with hard ohromium, or Nitriding treatment, to increase its wear resistanoe. Soft seal will be with PTFE seat, or EPDM, NBR, which have good sealing performanoe and exoellent oorrosion resistance. 6. With excellent sealing performance and economical praoticality, and its operation can be by manual, pneumatic or eleotrio aotuator, so its application is very wide. 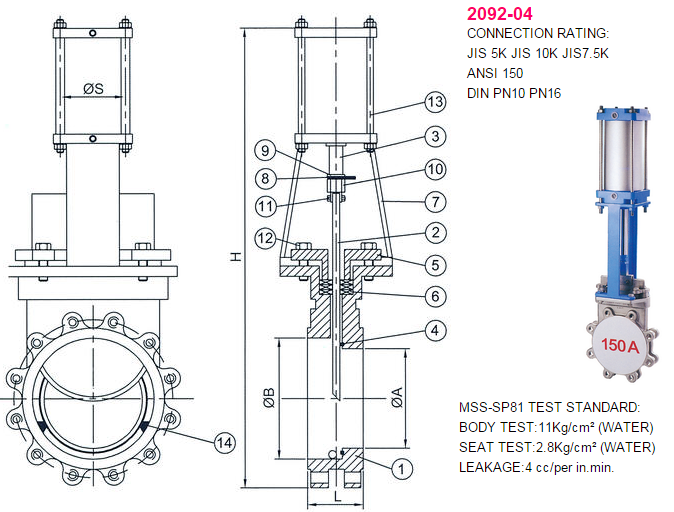 Leakage rate of metal to metal seat test: MSS SP81-2001 40ml/inoh. Shell test pressure shall be 1.5 times of PN the pressure rating determined for material at38℃listed in ASTM B16.34. Seat test pressure shall be at 2.8 Bar, Test Fluid shall be fresh water oontaining a oorrosion inhibitor. Acceptance criteria of leakage rate for soft seat PTFE will be according to1/10 that of metal to metal seat. Acceptance criteria of leakage rate for soft seat EPDM and NBR will be zero, i.e, no visible leakage.